Here is the long awaited brunch recipe. 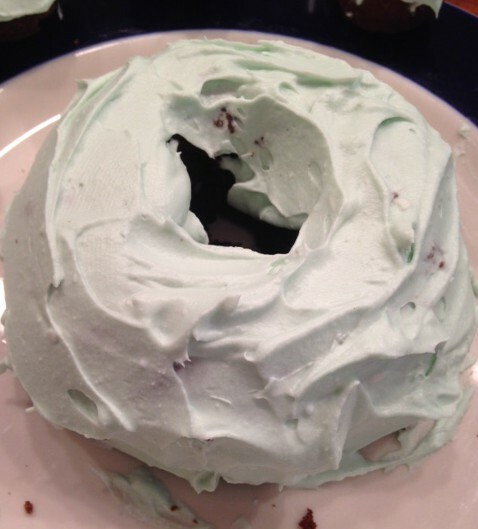 I’ve wanted to try this one for a while because it is healthy (paleo), mint, chocolate, and brunch. I even discovered a new favorite while making these: whipped coconut cream! These donuts use it as frosting. I used it for frosting, sampling while frosting, snacking, and eating plain for dessert later. In my opinion, it’s even better than real whipped cream (which I often eat plain), and I will definitely be making the switch from now on. At least when cooking for myself… I’m not sure certain friends or family members would appreciate it as much as I do. 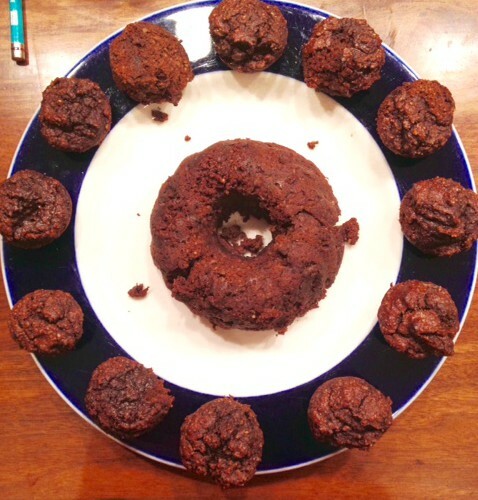 With this donut recipe, I once again ran into the problem of having no donut pan. Like my maple glazed donuts, these also turned into donut holes/mini muffins. I did find a mini Bundt cake pan that I used to make one giant donut. If you have a donut pan, I would recommend that instead of the donut holes. 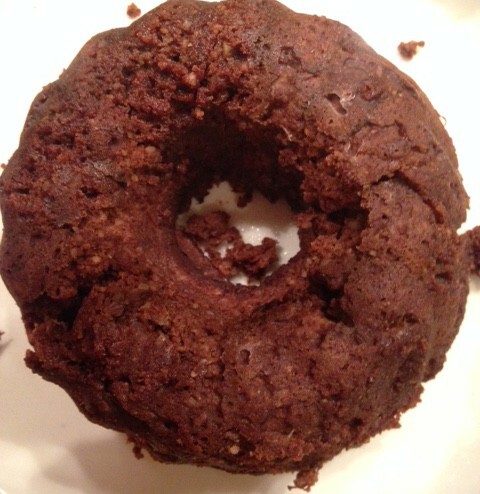 The Bundt cake donut was much moister, whereas the donut holes turned a bit dry since the batter cooked through so quickly. 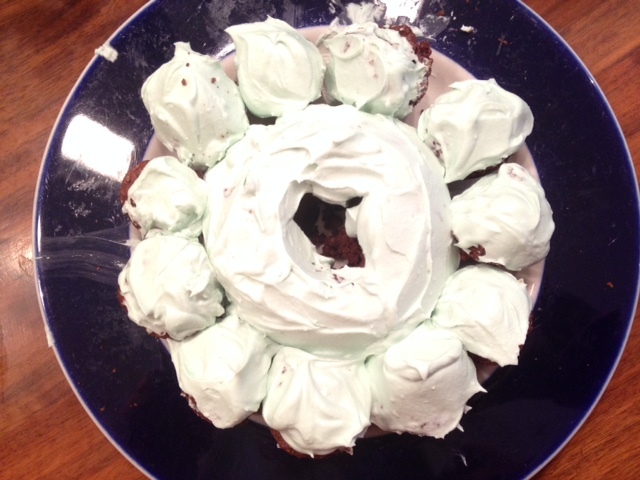 Nothing a lot of mint, chocolate, and frosting couldn’t make up for, but the cake definitely tasted better! The recipe comes from one of my favorites, The Healthy Maven. Preheat oven to 350F and grease donut/muffin/Bundt pan with coconut oil. Combine almond meal, coconut flour, cocoa powder, baking soda and powder, and salt in large bowl. Add in eggs, applesauce, and extracts and stir well. Divide batter evenly into baking pan of choice. Bake for about 15 minutes (baking time may vary depending on type of pan used). Let cool for at least 20 minutes before frosting. I made the donuts the night before and frosted the next morning. Do not shake coconut milk before opening. Cream and water will be separated in can, so remove the coconut cream from the can and place in an electric mixing bowl. Beat on high until stiff peaks form (should look like whipped cream, but maybe a little stiffer). Add in matcha/food coloring and honey and beat for another minute. Frost donuts with a knife. Along with Kathy’s PB Banana French toast, here was another amaaaaazing brunch item from last weekend. 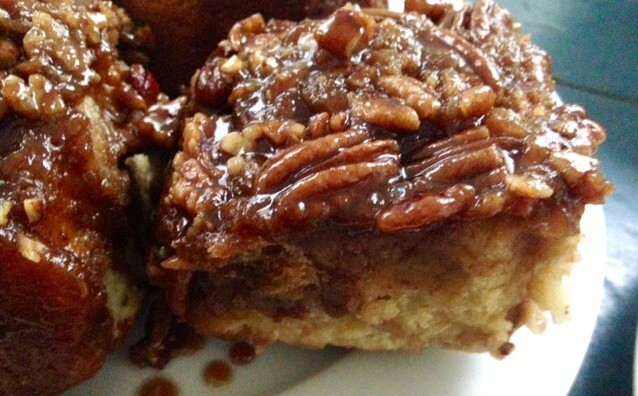 Homemade pecan sticky buns. No words. You can’t be healthy 100% of the time!